Wait a minute! I thought that Volkswagen’s I.D. electric series was to feature a three-vehicle lineup, but, now it’s four. I guess I must have missed something over the last year since the series first debuted at the 2017 Frankfurt Auto Show. Or, maybe I haven’t. Let’s see, after Frankfurt, where Volkswagen first introduced the original I.D. concept vehicle – essentially the I.D. Buzz MPV – the automaker added two models to the line, a hatchback and a crossover, the I.D. Crozz. That was where, I thought, things were to stand when the final model was, I thought, on sale in about four years. But, now, lo and behold, the I.D. lineup has expanded by one, the I.D. Vizzion. It’s part of VW’s promise to build 20 all-electrics by 2025. It also points to the carmaker’s plan for a new family of vehicles based on the I.D. name stretching from a Golf-class electric car to a fully automated premium class sedan. The I.D. Vizzion is the “largest model and innovative product campaign in the history of Volkswagen,” the carmaker says. Indeed, according to VW, the program is entering its next stage. The first stage was VW introducing the drivable electric versions of the I.D. family. For the second stage, VW is showing its concept of an autonomously driving car. These qualities, says the automaker, will enhance its value and extend its significance to future mobility. The I.D. Vizzion is, as noted, the fourth member of the I.D. family of vehicles. It will debut at this year’s Geneva International Motor Show. The new I.D. Vizzion concept car shows the direction VW is taking in technology and design of its future electric models. It is part of VW’s most significant product campaign in history. A key future value of the I.D. Vizzion will be its use for customers who are no longer able to drive, for example, due to age. And, a fully autonomous vehicle promises independence to groups such as the blind or disabled. Indeed, the I.D. Vizzion is not just about autonomous technology. It is as much about hope, in my opinion. Technology, though, is a substantial part of the appeal of the I.D. Vizzion. For example, the fully autonomous concept sedan gives passengers a new feeling. For some, it is the promised independence, while for others it is the design that creates a new automotive space without the usual steering wheel or visible controls. Indeed, it is likely the interior will be far more inviting than currently available autonomous vehicles are now. VW engineers have given the I.D. Vizzion a “digital chauffeur” that assumes control of the vehicle, allowing the concept vehicle to maneuver through traffic without a steering wheel or visible controls. To do this, the “chauffeur” has many assistance systems that enable its success. Meantime, passengers can structure their time as they would like during their “drives.” The concept uses a virtual host, with which the passengers communicate via voice and gesture controls, that knows the personal preferences of the vehicle’s occupants. Because it is wholly embedded can adapt to each occupant. A 225 kW electrical system, using 111 kWh lithium-ion batteries, powers the I.D. Vizzion. It has a range of about 350 miles when you factor in the energy recaptured by its regenerative braking system (a flywheel spinning captures energy when braking, storing it in the batteries). The I.D. Vizzion uses two electric motors, powering all four wheels, to move it along at up to 130 mph. Volkswagen has a complete all-electric architecture that will be the backbone of future VW electrics. It combines long driving ranges and maximizes its use of space. By 2025, VW plans to introduce more than 20 electric vehicle models. Starting in 2020, VW will begin to expand the I.D. lineup with a compact, the I.D.². 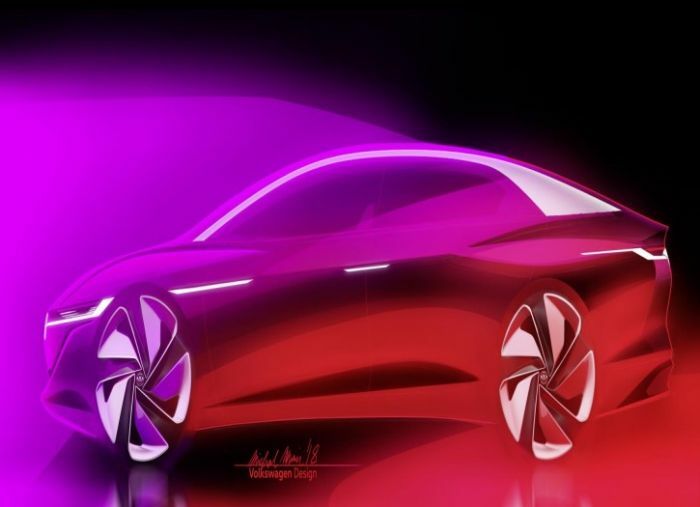 It will be followed quite quickly by a new electric SUV, the I.D. CROZZ³ and the I.D. BUZZ4, a spacious MPV.